Donna Potts began her role as chair of the English Department on Jan. 1. 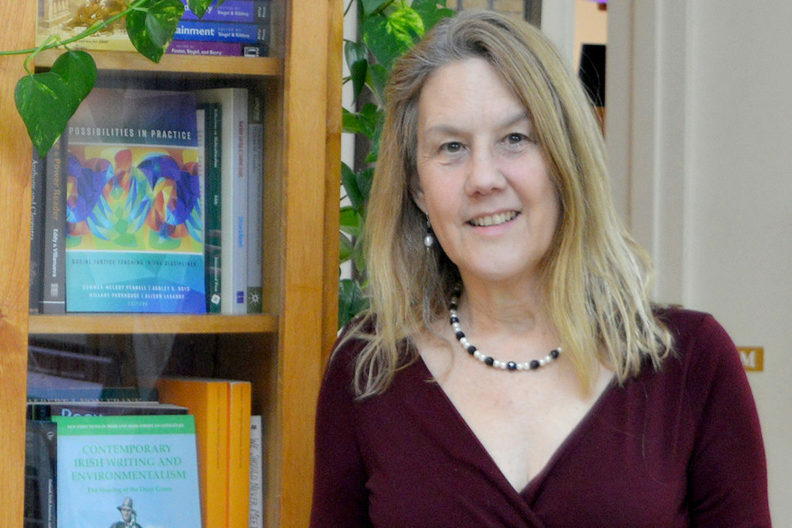 Donna Potts, professor of English and an expert in postcolonial studies and world literature, was selected in December to serve as chair of the Department of English in the College of Arts and Sciences. She began her duties on Jan. 1. A creative writer and poet, Potts joined WSU faculty in 2013 after a 22‑year teaching career at Kansas State University. She is a member of the WSU Faculty Senate and the universitywide graduate studies committee. She also directs the English department’s creative writing program. Her research interests include ecocriticism, women’s studies, Irish studies and trauma theory. Her publication portfolio spans eight books, nearly two dozen articles and an expansive list of invited lectures and presentations across the globe, from India to Ireland to Illinois. More than 230 undergraduate students are enrolled as majors in English and its programs in Digital Technology and Culture, and Women’s, Gender, and Sexuality Studies combined, along with 45 masters and doctoral students. The department is the third‑largest teaching unit in the College of Arts and Sciences, with more than 8,000 undergraduates taking classes in English each year in courses ranging from first‑year writing to advanced seminars. The English doctoral program at WSU boasts a job placement rate above 90 percent — nearly double the national average.